When: Sunday, March 16, 2014 at 2PM. Cost: Registration is $20.00 and includes a t-shirt, a pint of Guinness Beer and access to the Post-Race Party at Havana Tropical Cafe with complimentary appetizers and Guinness Beer. The race will begin at Havana’s, 409 Bay Avenue, where contestants will fill their cup and race to Miller St., and back to the finish line at Havana’s. The contestant with the most liquid in their cup at the finish line, wins the 1st Place trophy and $100 in Bid Bucks. 2nd Place will receive a $50 Bid Buck. What is a BID Buck? — No Idea.. I think the important take away here, is you get a Trophy and Guinness. Now if you got a trophy filled with Guinness even better. 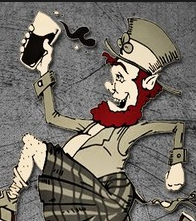 For those of you not into running there is a Post-Run St. Pat’s Pub Crawl from 3PM-5PM, registration is $10.00 and includes a Highlands t-shirt and $3.00 Imported Beer specials at participating restaurants. its from havanas to miller st and back. proceeds are going to the st pattys day parade.